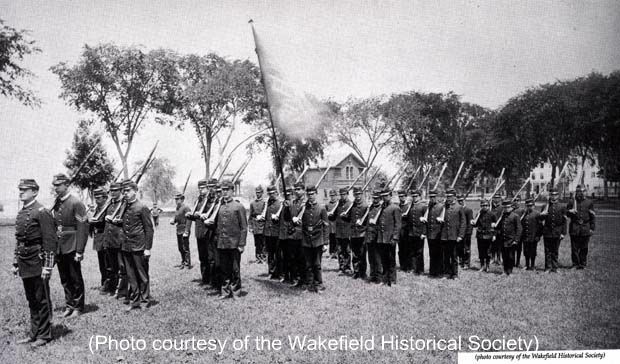 "The first military drills were introduced in October, 1885, when the 'boys of Wakefield High School' formed a military company and entered into the Second Massachusetts Regiment. Together with the cadets from Reading and Andover, the group formed a battalion. Local military men served as drillmasters and in later years, officers of the United States regular Army acted as instructors. For several years, the companies which made up the Wakefield Battalion held spring prize drills in the Town Hall and later on the park (common). Military drills were abolished in 1931, due to the crowded conditions at the high school and the overcrowding of the program. With the entrance of the United States in World War II, military training was thought to be of value to the young men entering the service. The program was resumed and required of all boys in the junior and senior classes.' -- Text from calendar by Jayne M. D'Onofrio. E. Amos Knight, Captain F.S. Hartshorne, First Lieutenant G.F. O'Connall, Second Lieutenant H.N. Dolbeare, Acting Orderly Sergeant W.S. Ripley, Jr., Acting Second Sergeant. “Wakefield High School Cadets, spring, 1886,” NOBLE Digital Heritage, accessed April 20, 2019, https://digitalheritage.noblenet.org/noble/items/show/7130.